Soft almond bits blended into a honey flavored taffy. First introduced over 90 years ago, the Bit-O-Honey candy bar is an American classic that lasts a lot longer than most candy bars. The enticing chew of this treat, made up of honey-flavored taffy with small almond bits inside, makes for a satisfying snack that's low in fat. 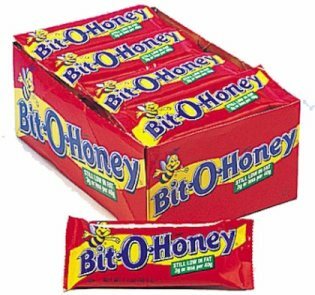 Each Bit-O-Honey candy bar is 1.7 oz.